Below you will find a heart piece guide for Skyward Sword, listing every piece of heart found in the game. 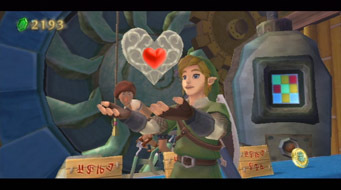 Unlike the previous console Zelda title Twilight Princess, Skyward Sword returns to the standard quarter heart pieces, meaning you must collect four pieces of heart to get a full heart container. 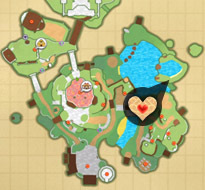 These heart pieces can be found in the overworld and in some dungeons. 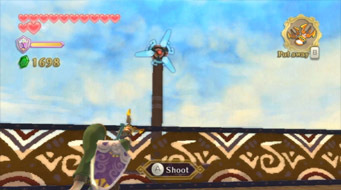 Also, unlike any previous Zelda game, you will start off with 6 hearts in Skyward Sword. 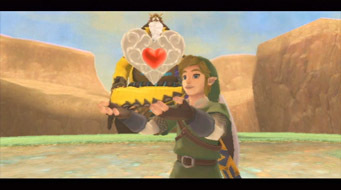 After defeating a boss, you will also receive a full heart container for your trouble. 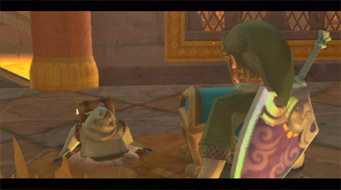 For full context as to where each heart piece can be found within the game, be sure to take a look at our Skyward Sword Walkthrough. 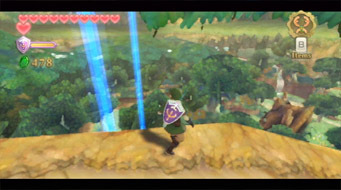 As you pass through Faron Woods, you'll come to a spot where there's a natural landbridge that makes a sort of "m" shape, with the middle of the "m" being a ramp. 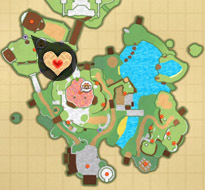 Climb up and take it to the far left (towards the tree) and you'll see a platform extending from the Great Tree containing a Piece of Heart. 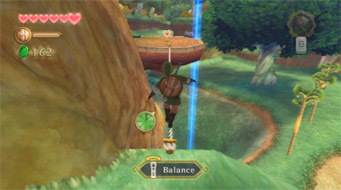 Use the tightrope to get across, balancing with the Wiimote. Inside the Lumpy Pumpkin, the owner is very proud (and protective) of his fancy chandelier (that has a Piece of Heart on top of it). If you go upstairs, you'll see signs warning customers not to bonk anything. 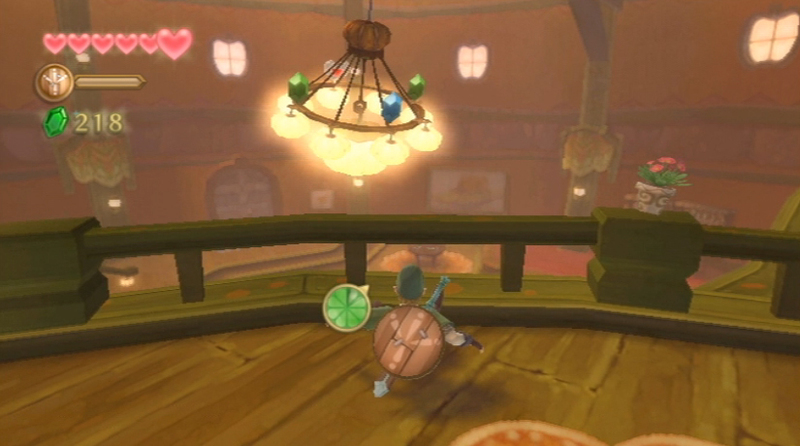 Purposefully roll repeatedly into the railing or wall nearby (upstairs that is) to make it crash down. Go snag the Piece of Heart. Pumm, the owner, is very upset with you and wants you to work off the debt (which leads to another Piece of Heart later). 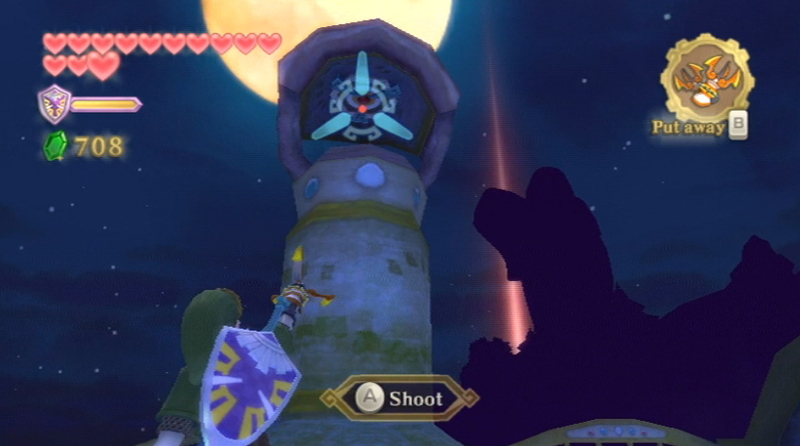 Located just outside the entrance of the Skyview Temple. Within Goddess Chest #2 on a small island just west of Pumpkin Landing. Within the Skyview Temple, in the central room with the giant bird statue (where you got the Beetle), run to the back side of the bird statue itself (north) and face towards it. You'll see a Piece of Heart behind bars. 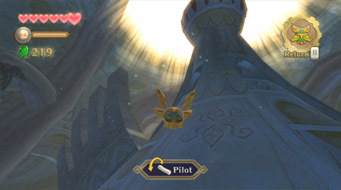 Stand sort of close to it, now use your Beetle and fly it to the top of the bird statue itself. As you near the top, you'll see an inner alcove in the neck of the statue that is only open on the north side (back side of the statue). 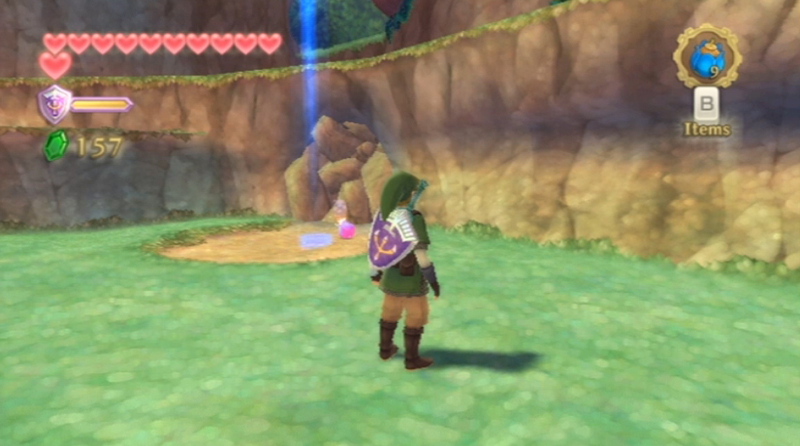 Hit the crystal switch (you barely have enough air time, this is normal) to open the gate and claim your prize. 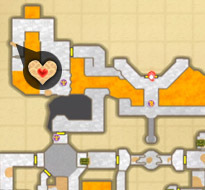 The second prize from Batreaux (for 20 Gratitude Crystals) is a Piece of Heart. 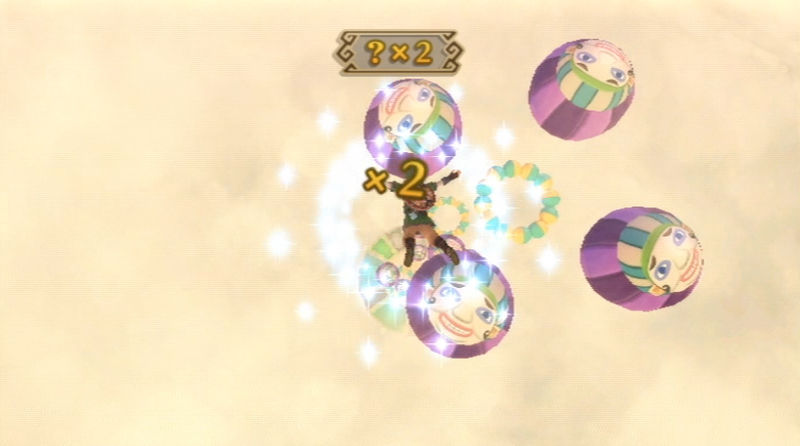 You should easily be able to get enough Crystals to earn this before you even enter the Eldin region. 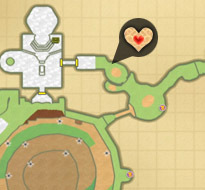 For more info about this side quest, refer to our detailed Gratitude Crystals Guide. 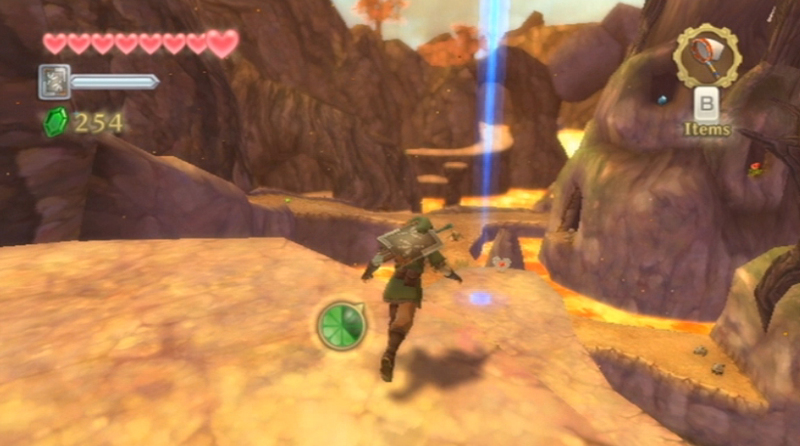 As you are first going through the Eldin region, you'll come to a skeletal bridge in the middle of the lava. 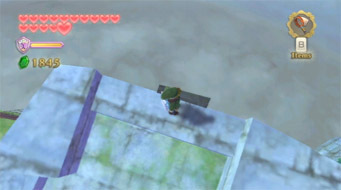 Instead, turn right and climb up the nearby platforms, which circle around along upper ledges that eventually lead to a Piece of Heart. 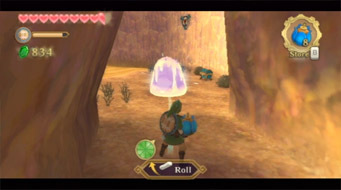 Return to Faron and use a Bomb to blow up the cracked wall, unveiling a cave containing our favorite love shaped treat. 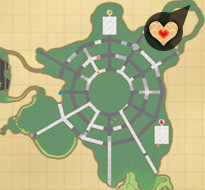 Within the Lanayru Desert, there's a skinny passageway in the northeast corner of the map. You'll see one of the underground roads leads to one end of it (right side). You can jump down onto that road and head to the passageway entrance, which is a cracked wall. 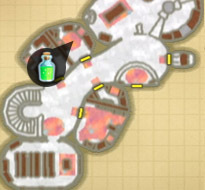 Blow it up, then follow the path which eventually leads to a chest. Happy day. At the northwest part of the Temple of Time, there is a mine cart that you can activate using a timeshift stone. Activate it and ride it across the gap. 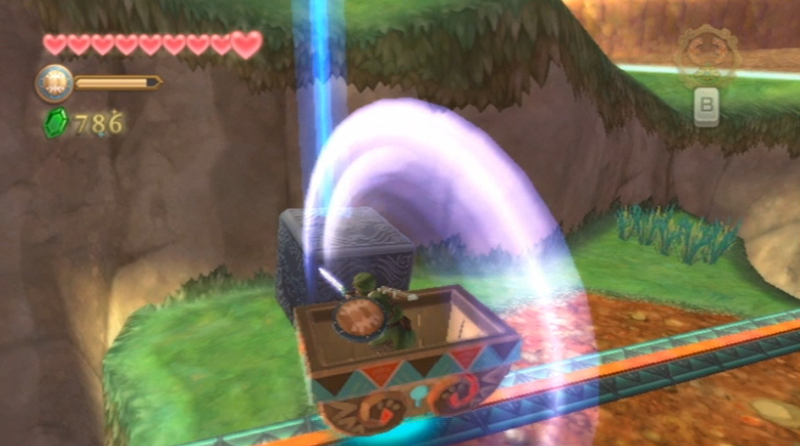 Deliver a Skyward Strike to a Goddess Cube while on the mine cart. If you miss, don't worry, just hop back in and try again. 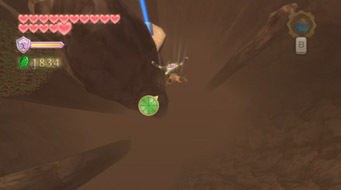 Just above Beedle's cave dwelling on Beedle's Island. In the northeast side of the Sealed Grounds, Gorko is usually hanging out. On the higher platform, he's now studying the Blessed Butterflies. 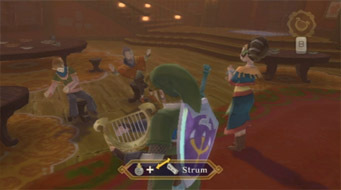 Stand next to them, pull out the harp (up on the D-pad), and strum to make a Goddess Wall appear. 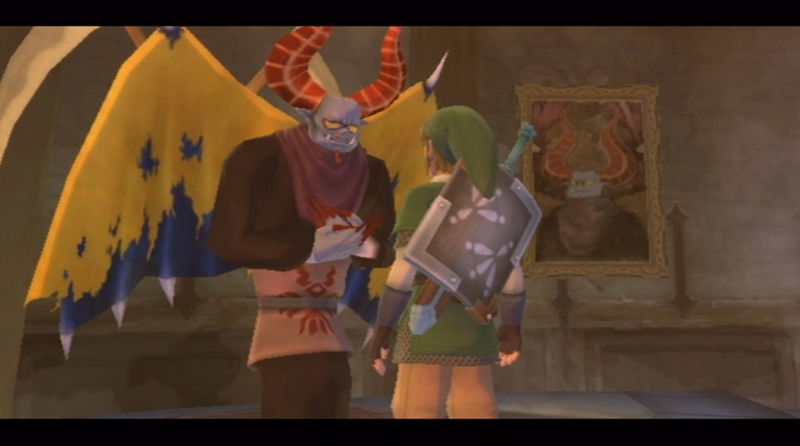 Speak with Gorko again, and he'll mention one of several different phrases, a clue to one of the different objects you can draw on the Goddess Wall. Correctly draw the one he mentions and he'll give you a Piece of Heart. If you mess up, draw poorly, or draw the wrong object, he'll thank you and ask you to come back later when the Wall has recharged. Pumm wants you to work off your debt for breaking the chandelier in the Lumpy Pumpkin, and to get you started, you can deliver some Hot Pumpkin Soup to Eagus. You only have five minutes (an eternity for this) before it cools off, so be sure to do it before then. 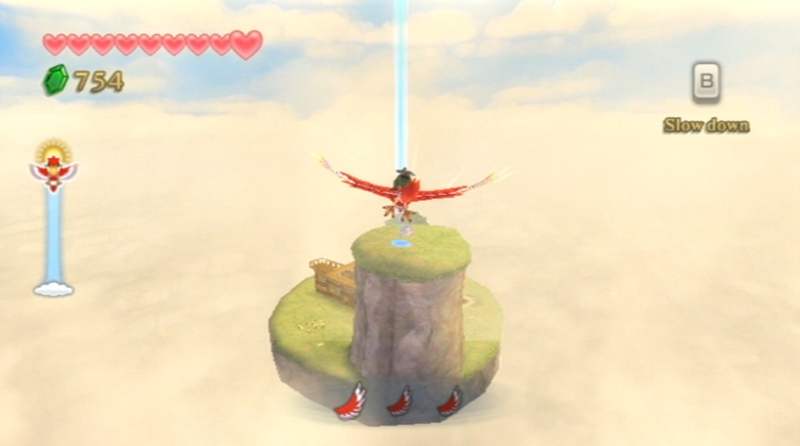 Run outside, hop on your Loftwing and return to Skyloft. Eagus is found in the Sparring Hall next to the Knight's Academy, the burly guy who taught you how to use the Practice Sword. Talk to him and say the Soup is for him and he'll gulp it down. 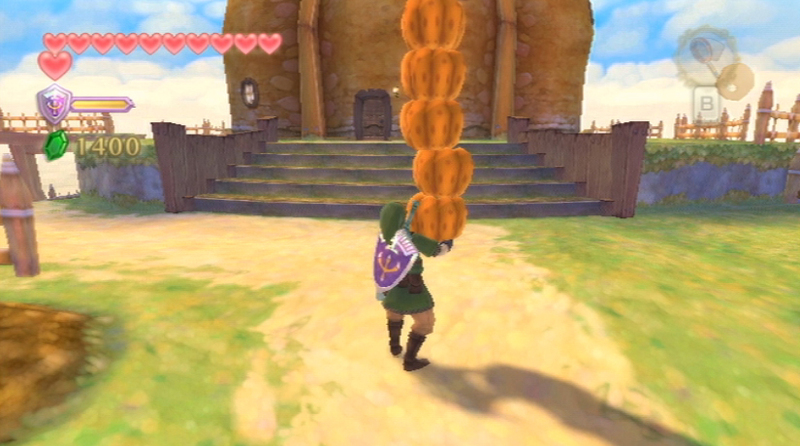 To help pay off your debt, Pumm wants you to help his daughter Kina harvest the pumpkins in the patch out back. Go speak with her and she'll have a little game for you, involving balancing five pumpkins at at time and bringing them to nearby storage shed. Return to Pumm in the Lumpy Pumpkin after you've completed the previous events, (broken the Chandelier [Heart Piece #2], delivered the soup, helped with the harvest,) and he'll have one final mission for you. Sleep in one of the beds, then talk to him at night and he'll want you to play your harp with his daughter to entertain the guests. 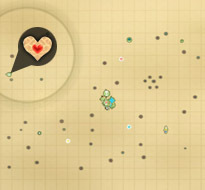 The first time you successfully complete this mini-game, he'll give you a Piece of Heart. 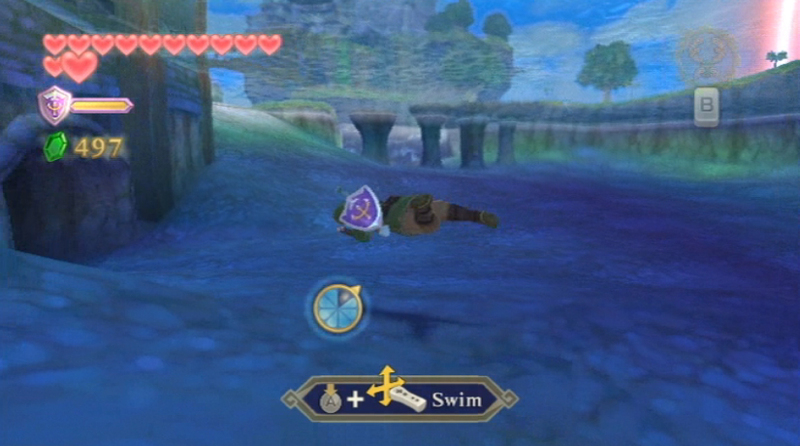 Afterwards, you can do this and all of the previous tasks to earn Rupees. Is the harp playing difficult? Check out our "How To Play The Harp With Kina" video to see how it's done! The clown on Fun Fun Island has been preparing a game for the enjoyment of all...! 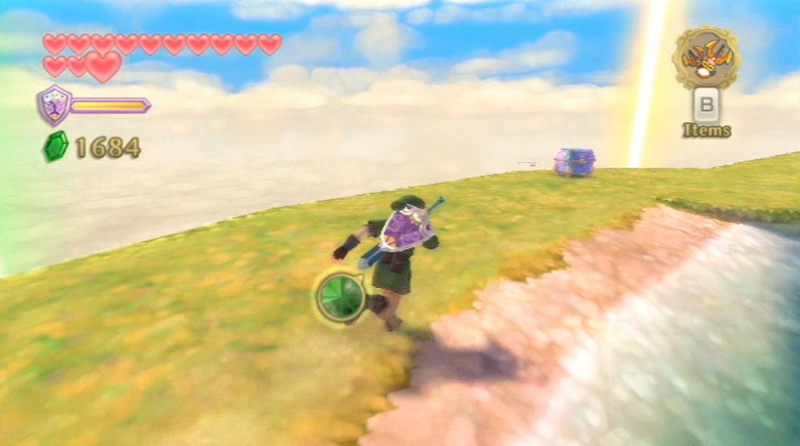 But alas, his party wheel has fallen to the land below! The HORROR! Once you've spoken with him, Fi will allow you to Dowse for it. Go to the Lanayru province and drop down to "South Desert." 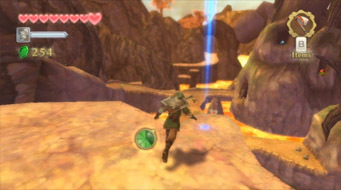 Go towards the mine cart to the south and blow up the rocks here. 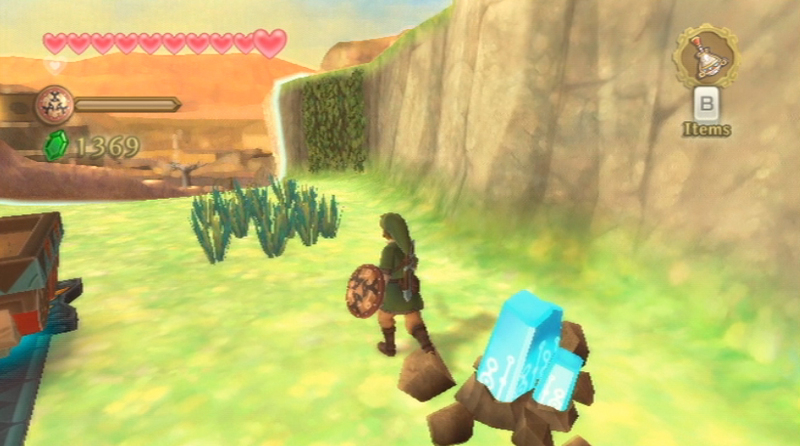 Hit the Timeshift Stone that was hiding in one of them, then climb the vines that appeared nearby. Grab onto the nearby handhold and take it to the far left. 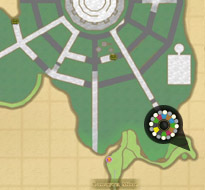 Follow this path to find the Party Wheel. 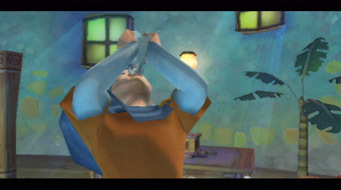 Have Fi call Scrapper, then return to the Sky and bring it back to Fun Fun Island. 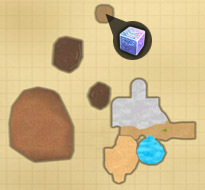 For more info, refer to our Gratitude Crystals guide. 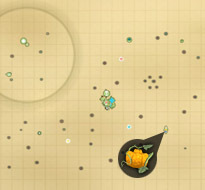 Once you've retrieved Dodoh's Party Wheel, he'll have a game available for you. Pay him the money and he'll shoot you out of a cannon. 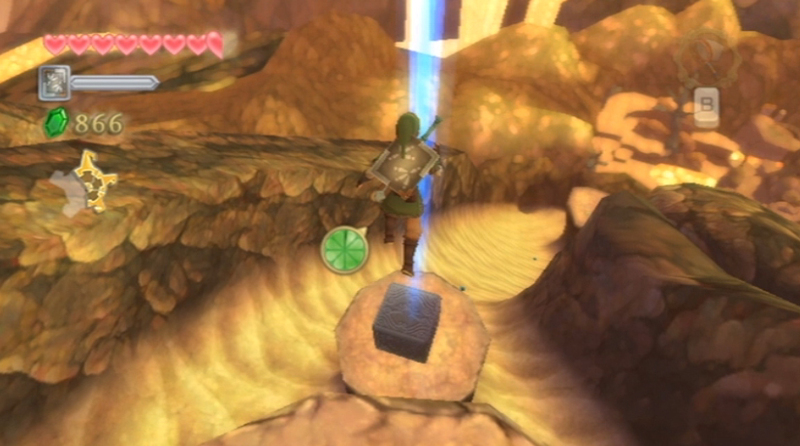 Tilt the Wiimote to glide and control your fall. You want to AVOID the "Dodoh Balls" and go through all of the rings. If you land on the multi-colored panel, you'll win 50 Rupees (times your multiplier). The first time you do this successfully, you'll also win a Piece of Heart. My suggestion is to watch the panels when you go through the last ring. 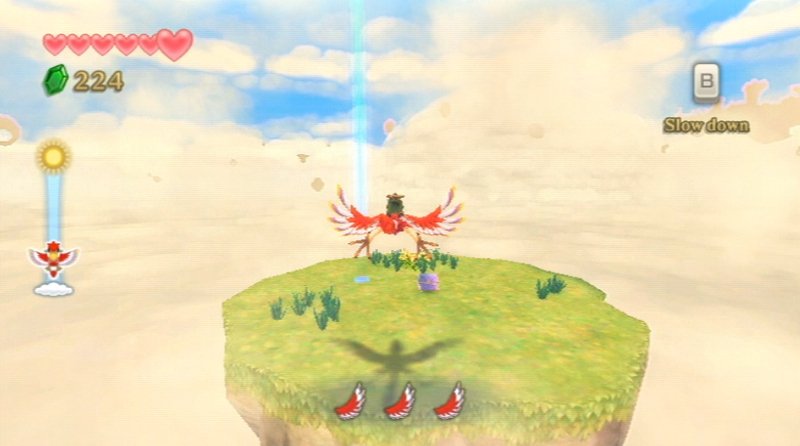 Whatever their positions are, they will be 2/3 of a turn to that same position when you land. 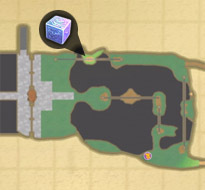 So, if your target is at "3:00 oclock" when you hit the last ring, it will be at about "7:30" when you land on the platform. 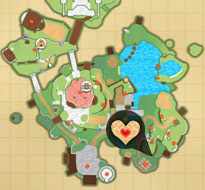 In the northeast corner of the map is the giant sand slide. 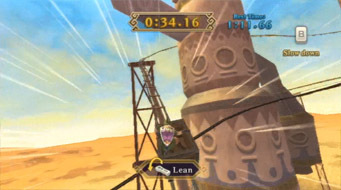 Slide down and into the left air geyser, which takes you to a higher platform. 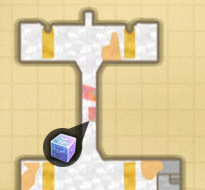 Just in front of it, there is a lower platform with the Goddess Cube. Jump down to that one and deliver a Skyward Strike. Jump into the main river of Skyloft and you'll find an underwater passageway at the base of the windmill. 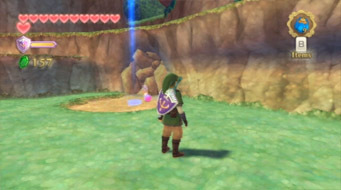 Follow this passageway and you'll reach the small pond within the storage shed, with the treasure chest located nearby. As you climb to the top portion of the Great Tree, you'll pop up back outside, walking counter-clockwise around the tree for just a bit until you are at the southeast part of the tree. Look down below and you'll see the Goddess Cube. 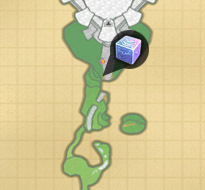 Carefully drop down to the area below and use your Sail Cloth to reach the Goddess Cube. 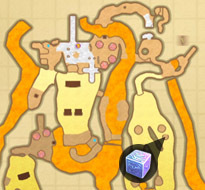 Alternatively, if you want to wait until later on in the quest, you can get to this Goddess Cube easily by using the Clawshot. 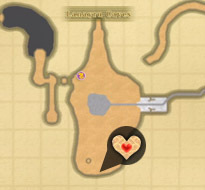 Just east of the entrance to the Lanayru region is this "volcano island." 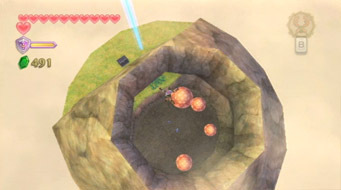 Fly over it and dive off your loftwing to land inside the volcano. The Goddess Chest is located on an upper ledge inside, so you'll have to tilt the Wiimote to land on the platform before you fall too far. 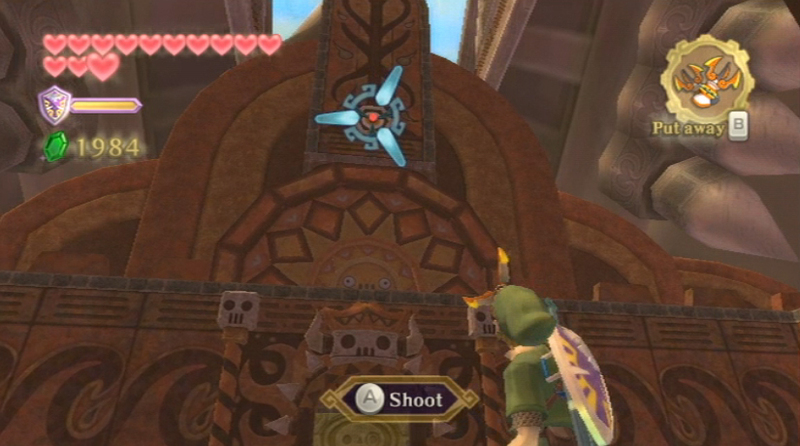 Alternatively, you can return here later when you have the Clawshots and grapple the target. 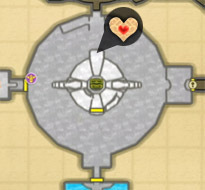 As soon as you leave the Pirate Stronghold mini-dungeon, turn around. You will see a clawshot target above the door, now that the skull-thingy has been removed. Claw on over and then to another target. This leads to an upper platform with a Goddess Cube. In Skyloft on top of the waterfall island. 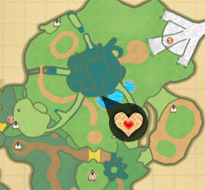 Use the Clawshots on the northern island, then grapple onto the higher, big island to reach the chest. 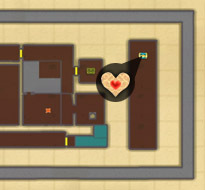 Once you get the map, you'll see an area to the far right side of one of the mid floors that you can't reach, and it has a chest on it! How do we get there? Hmm... From the main deck, climb the mast and use the gear pullies all over the place until you get to the very end. The last one leads to the stern (east). There's nothing here, but what's that in the distance? Clawshot the target on the beam at the back of the boat, drop down to the chest and snag a Piece of Heart. Oh baby! Return to the Shipyard and the Goron now hosts the Ricky Coaster mini-game. 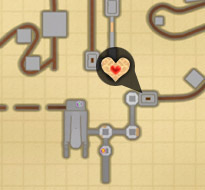 Take the "Heart Pounding" course and complete it in under 65 seconds to earn a Piece of Heart. 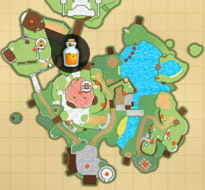 After completing the Lanayru Mining Facility, purchase Stamina Potions from the Bazaar and bring them to Fledge in the Knight Academy in his room at night. Give him potions to help him keep going with his push-ups and return later to give him a second potion. 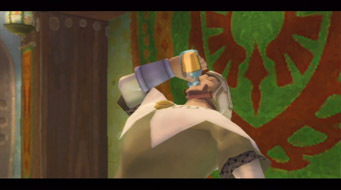 If you do this as early as possible, you can then come back to his room after the Sandship and he'll reward you with Gratitude Crystals. For more information, check out our Gratitude Crystals page for details on completing this quest. Once Fledge has built up his self confidence and is feelin' pretty buff, he'll start up the Pumpkin Pull mini-game near the Sparring Hall. 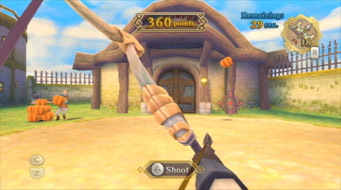 Hit the Pumpkins with your bow to score points, but hit them repeatedly to build up and keep your combo (max of 50 points each). Score 600+ points total to get a Piece of Heart. In the waterfall area of the Volcano Summit, there is a ledge where Link can dive off of. Run the ledge and tilt the Wiimote to glide forward. 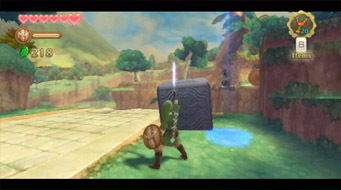 A lower platform behind a pillar will come into view, containing a Goddess Cube. Glide over to it and use the Sailcloth to land safely. 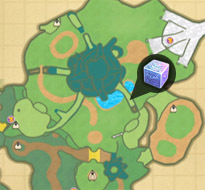 After Striking the Cube, use the obvious path of vines to work your way back. 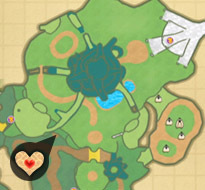 Bug Island in Thunderhead. The chest is found on a small wooden ledge at the southwest part of the island. To reach it, head to the very top and stand on the "castle-like" overhang above the water. Look over the edge. See the wooden platform below? Hop down and open the chest. To leave, Clawshot the nearby vines. Near the end of the dungeon, you encounter a Mogma who runs away from you and keeps you from moving on by pressing a gate switch. 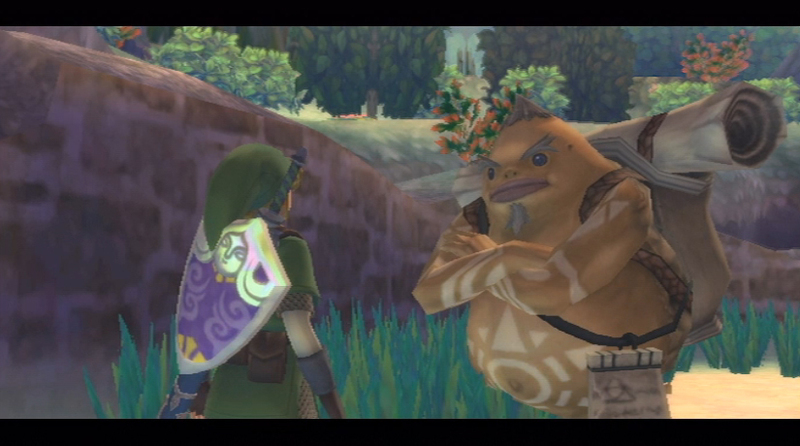 Once you have caught him, he'll allow you to progress, but he'll also gift you with a chest containing a Piece of Heart. 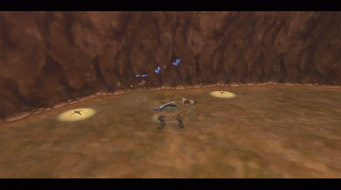 In the portion of Volcano Summit just outside of the Fire Sanctuary, there's a soft soil patch against the east wall in the southern part of the area. Tunnel down, crawl through and open the chest on the other side. 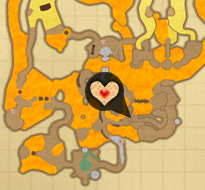 This Piece of Heart is for sale for a whopping 1600 Rupees, meaning you'll have to upgrade your wallet at least a few times before you can even consider it. It may be wise to buy this after completing Beedle's Gratitude Crystal sidequest, which will half the price of your next purchase in his shop. Return to Lanayru Gorge and speak with the Lightning Dragon, who has some challenges prepared for you. The "lightning challenge," (boss rush mode) allows you to try defeating bosses you've already faced in a row, without stopping to heal. Depending on how long you stay, your potential prize will keep getting better. 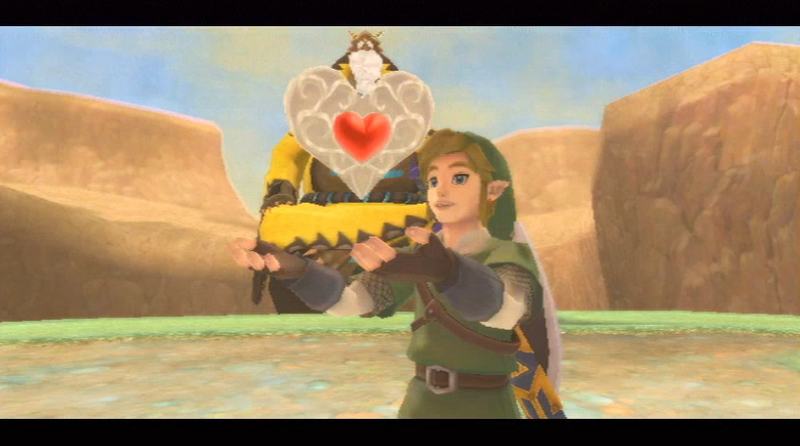 Quit after defeating exactly four consecutive bosses and you will recieve a Piece of Heart.